A “thriving economy” does not include salary or wage increases for Americans or their adult children, according to House Speaker Paul Ryan’s enthusiastic description on May 17. A thriving economy means there are more job openings. A thriving economy means there are more opportunities. A thriving economy means families get ahead, people get out of poverty, kids come out of college with opportunities and offerings. That’s what a thriving economy means — and there could not be a better time to take action to help more people join our workforce. Ryan’s decision to exclude wages allow him to ignore the most startling impact of Trump’s economy — the growing marketplace pressure on business to provide a wave of wage increases to voters. This wage-pressure has not existed since 2007, or 1998, or the 1960s, depending on how wages are measured. But Trump-generated wage increases are a big problem for Democrats. It is entirely possible that you could see instances of higher wages offered in response to a clear message that business is not going to be able to rely on foreign workers … and it certainly worth trying — it is not as if they are rolling to victory now. Ryan’s dismissal of wage growth comes as investors and CEOs face unprecedented marketplace pressure to raise wages. The pressure is especially painful for Wall Street investors because every dollar directed back to wages is a dollar taken from the future profits that support current Wall Street investments. That is a good number, but is well below 2007, when “82 percent of the private sector workforce received real wage gains,” according to a 2007 NAM report. NAM declined to provide additional information about the 2018 survey to Breitbart News but did credit the coming wage gain to the tax bill, not to Trump’s low-immigration policies. However, Trump’s policy of “Buy American, Hire American” deserves credit for the wage pressure, in part because CEOs complaints started well before the tax bill was passed. The combination of Trump’s stronger immigration-enforcement push and the growing economy is delivering higher wages and overtime to many employees, including African-American bakers in Chicago, Latino restaurant workers in Monterey, Calif., disabled people in Missouri, high-schoolers, the construction industry, Superbowl workers, the garment industry, and workers at small businesses, and even Warren Buffett’s railroad workers. Still, the wage raises have been scattered, small and have done little to make middle-class Americans feel more confident and secure. A May 9 poll from Monmouth University, for example, shows that 65 percent of Republicans, but only 44 percent of independents, say their family has benefitted greatly or somewhat from the economic gains. In response to the tight labor market, Ryan is not urging CEOs to raise wages but is instead trying to raise the labor supply for CEOs. This going to get more people out of poverty. This is going to help people get a steady job. This is going to get more people moving towards a good career. It will help people go from where they are to where they want to be, to realize their own version of the American idea. 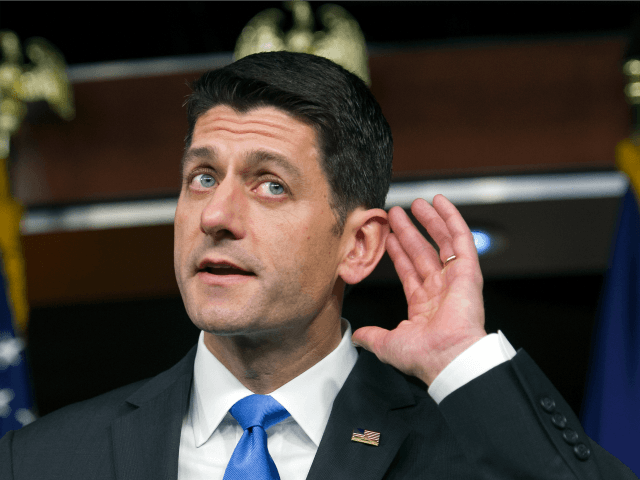 To get that amnesty bill, Ryan is raising funds which are provided by his business allies to the pro-amnesty Republicans who are pushing the amnesty-discharge petition. Ryan’s support for a bigger labor-supply reflects Ryan’s long history of supporting “any willing worker” policies which allow companies to hire cheap foreign employees instead of middle-class Americans. When talking about Wisconsin’s dairy industry, for example, he has repeatedly urged continued reliance on immigrant and refugee workers instead of labor-saving automation, such as cow-milking robots built by employees in Iowa. To the extent that government has its thumb on the scale in the economy, it should be in favor of employees over employers …when in doubt, the impact should be to benefit the ordinary working people, and a tight labor market [caused] through less immigration does that. The government supply of extra immigrant labor prevents companies from innovating, he said. Clearly, when the Republicans talk up guest-worker programs and importing foreign workers, business factors that into their planning and decisionmaking. If business figures they will be able to import more workers, they don’t start thinking outside the box about how to recruit and train American workers. Politicians’ comments shape the expectation of corporate planers — as well they should – and it is a perfectly rational response. The opposite message – ‘You will not get this unending flow of [immigrant] workers’ – would also shape their planning in a way that is more beneficial for the country.